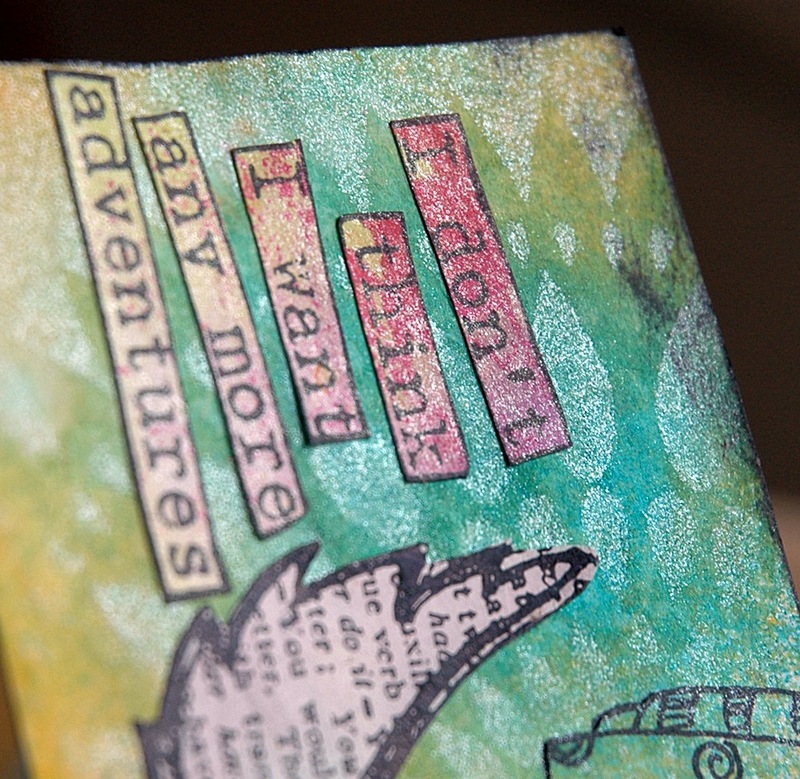 I’m finally back to finishing the last 10 ICAD’s from this summer! 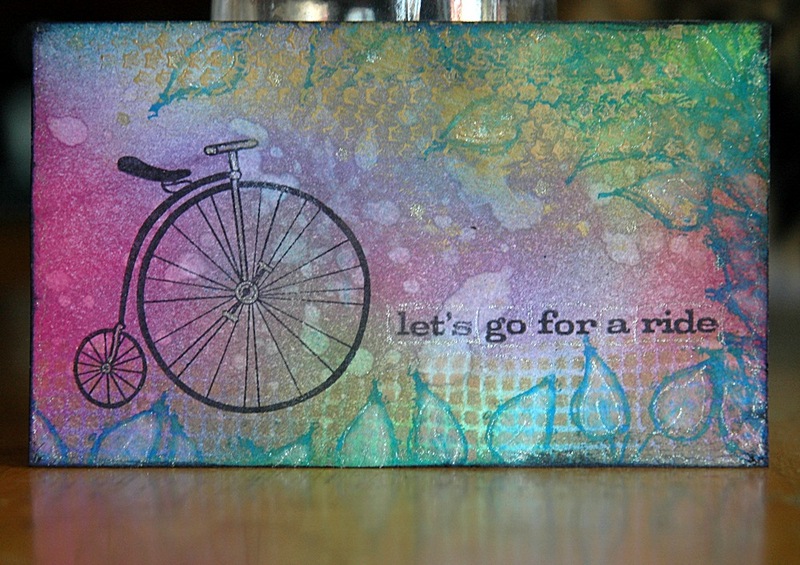 For this one I smeared light molding paste over a fun stencil, Bug Doily, and let it air dry. I then painted over it with my cheapie water colours paints, blending them together. Although I really liked the blending colours, I wanted a bright spot and that wasn’t happening so I misted the centre with Lemon Zest Dylusions Ink Spray and then blended around it again. 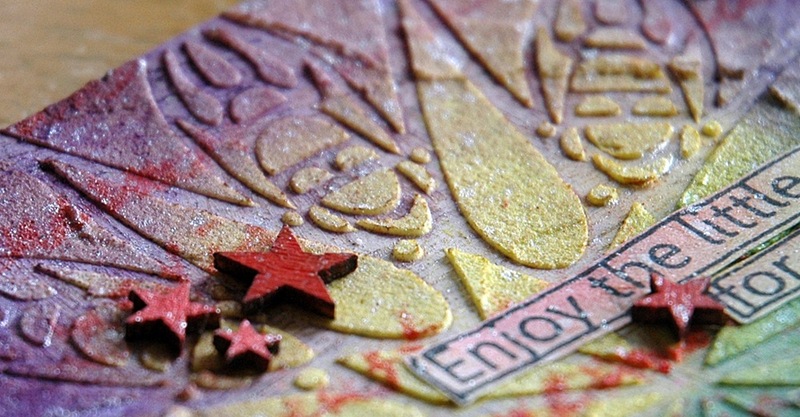 Over that I stippled watercolour paint through another stencil, Art Is, and painted the wood veneer stars. 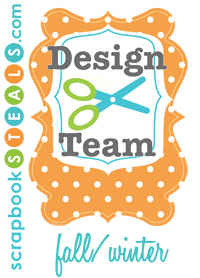 The sentiment is, of course, stamped over a premade background and cut out! 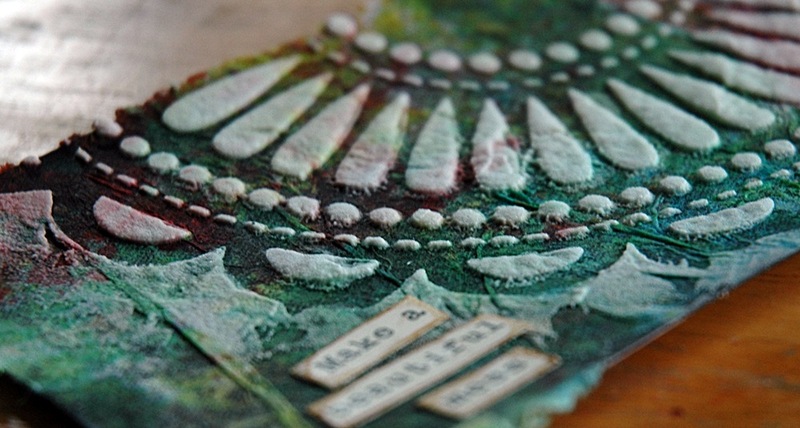 I love the texture of the molding paste, especially with the text over it. And the addition of a quick spritz of Studio Calico Shine? Awesome! 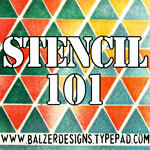 I’ll have another post later today with the LO’s from my upcoming stencil class – stay tuned! I recently got some black gesso and decided to use it on an index card. It didn’t turn out as planned! So I took some old paper towel and adhered it with gel medium. Because of the black base, it turned out pretty dark which is why I added Golden Light Molding Paste over the Peony stencil to cover the majority of the card – it lightened it up quite a bit, thank goodness! I heat set the molding paste, since I like the look when it puffs up, then added the sentiment from some Cosmo Cricket word stickers. After a bad start, I really like how it turned out! And the detail from the stencil is awesome! Here’s a bonus for you today – M did one last index card! Of course, she had to use the “sparkly pots” aka my Twinkling H2O’s and she covered the whole card in gold. 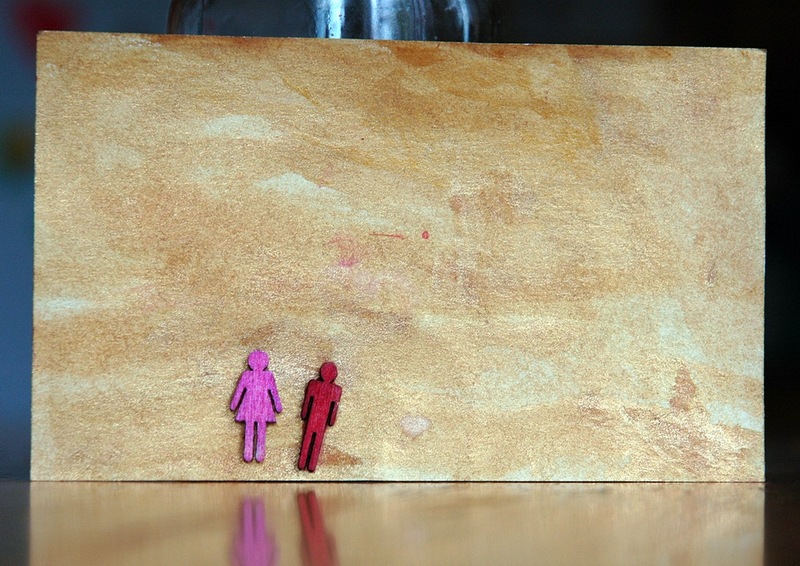 She then painted little wood veneer people and when the card was dry, stuck them on. She’s pretty minimalist, so she said that was it! I love the colours she used! This is one of my recent faves – I love the bright colours! 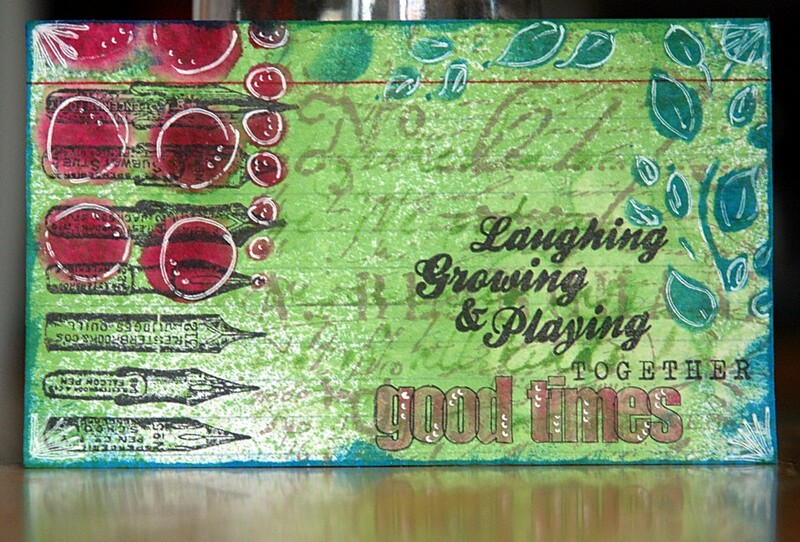 I first added molding paste over another new stencil, Zinnia, and then misted with my Dylusions Ink Sprays. I added a couple of stamps but it was still just not quite right. 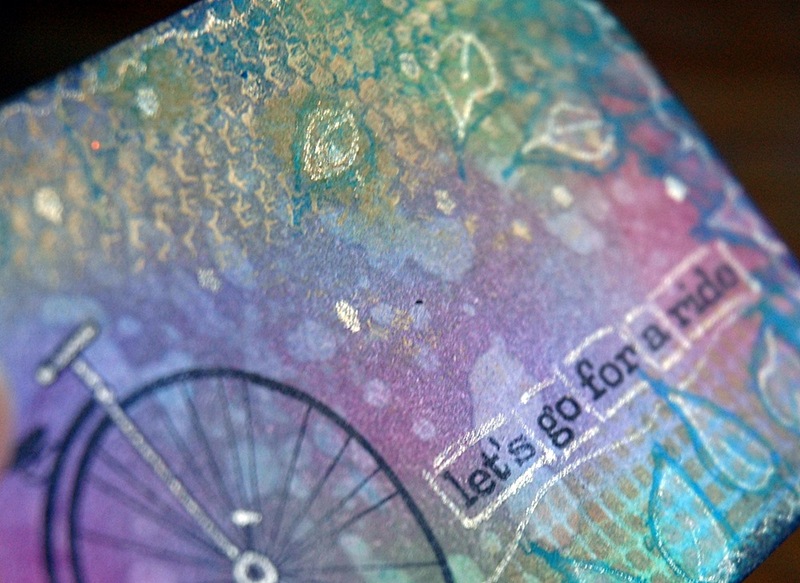 Then I saw the mask left over from card #48 and since it was covered in a different colour mist, I added it to the mix. Love how it turned out! I little bit of colouring and some more Cosmo Cricket word stickers and it was done! I did these two cards at a crafty night out with some friends. I had new stamps (Dylusions, of course!) and wanted to play! I am not a fan of this card. You know how you have an idea in your head and it just doesn’t work out? Yeah. That’s this card. 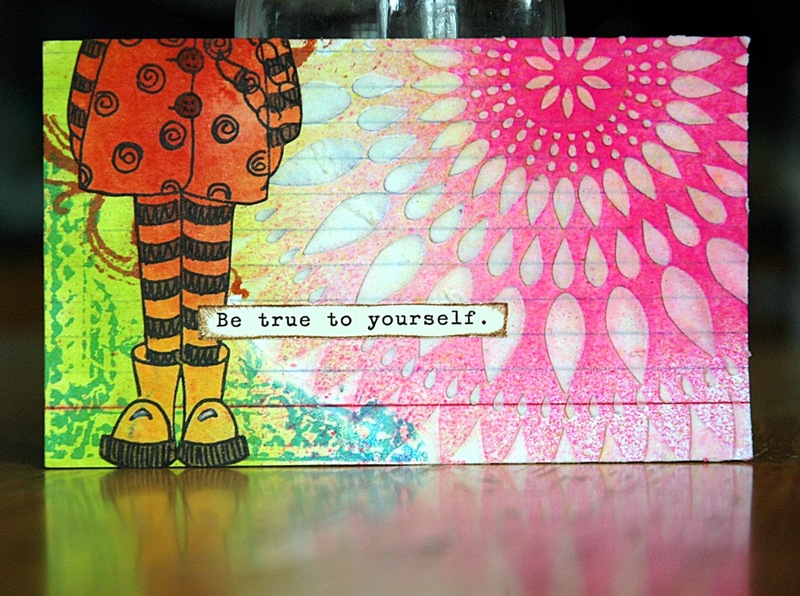 First I stamped the body image and masked it. Then I misted with water, then Dylusions, then water again to blend. I went a little overboard with the liquid and had a far amount of seepage under the mask, though that didn’t bother me – I kind of liked it anyway! I then stamped the head image, but didn’t like it so I stamped it again and cut it out, colouring before adhering to the card. 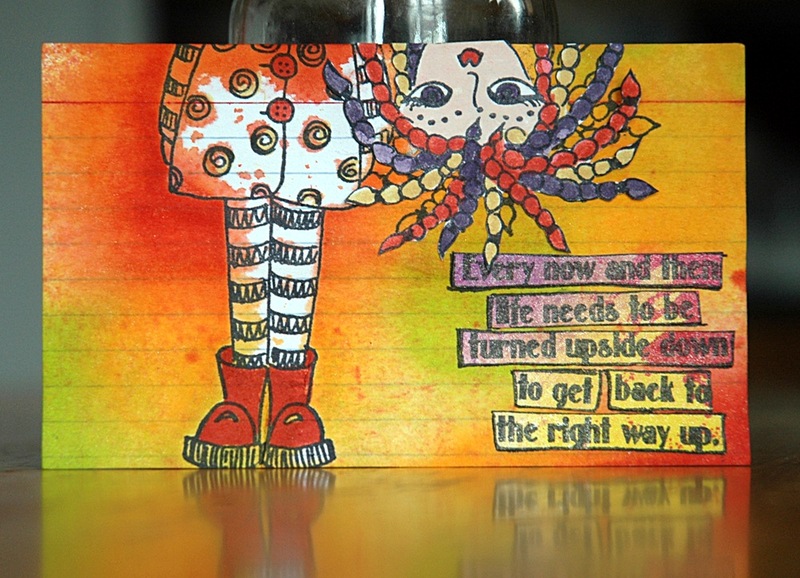 I stamped and cut out the sentiment and then added it. 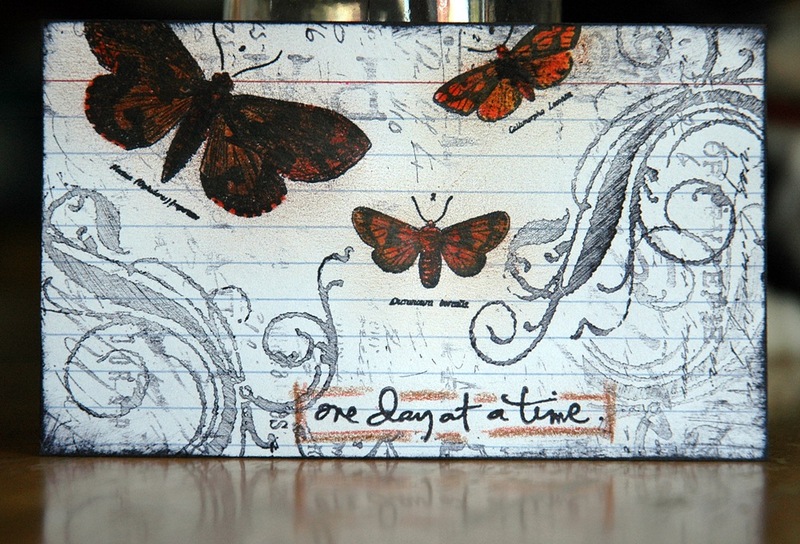 Now this card was the opposite of the first – it turned out better than expected! Again I misted and sprayed the background over a stamped body image but then I misted Studio Calico Shine over a stencil to give a little pop to the background. I stamped and coloured the boots and wings over a gessoed card, which helped me blend and lighten the marker colours. 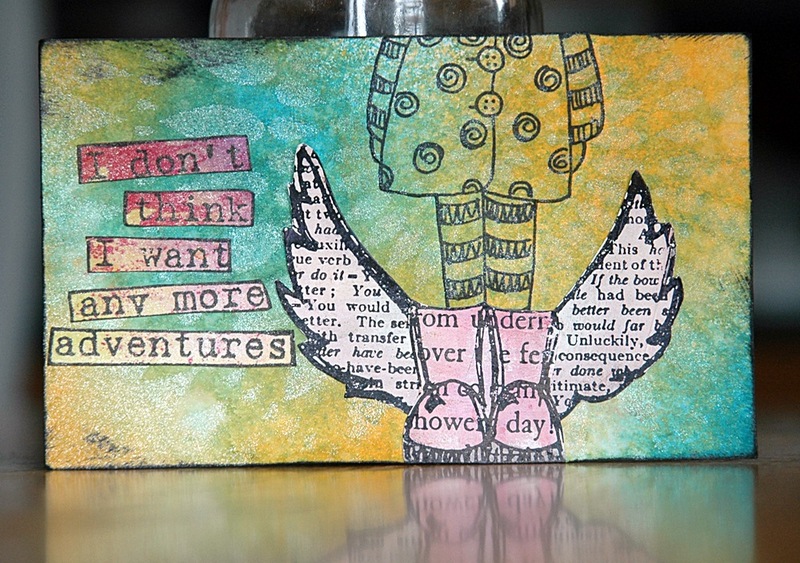 I cut and added them to the card and then thought the sentiment was perfect for the winged boots. Lots of shine and there’s some good dimension with the wings too (though I didn’t get a good picture of that) – they’re only adhered by the boots so they fly off the card. If you follow me on Twitter, you already know that this card did not want to be made – it blew into the pool and got soaked twice! Thank goodness for permanent ink! The ink in the background (Hero Arts Shadow and Mid-tone Inks) did bleed a little but the stamped pattern is still perfectly intact. I drew the mandala with my black Zig pen from Kuretake and added a few tiny highlights with my white Uniball. 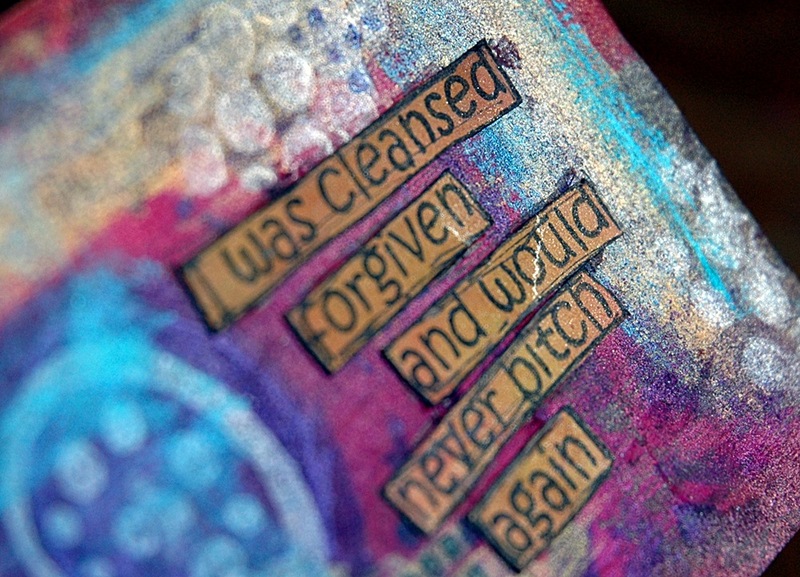 #47 – I was cleansed forgiven…. This one was just fun to do. I used my Twinkling H2O’s and randomly painted, adding extra colour here and there, then added in some stencils and punchinella. 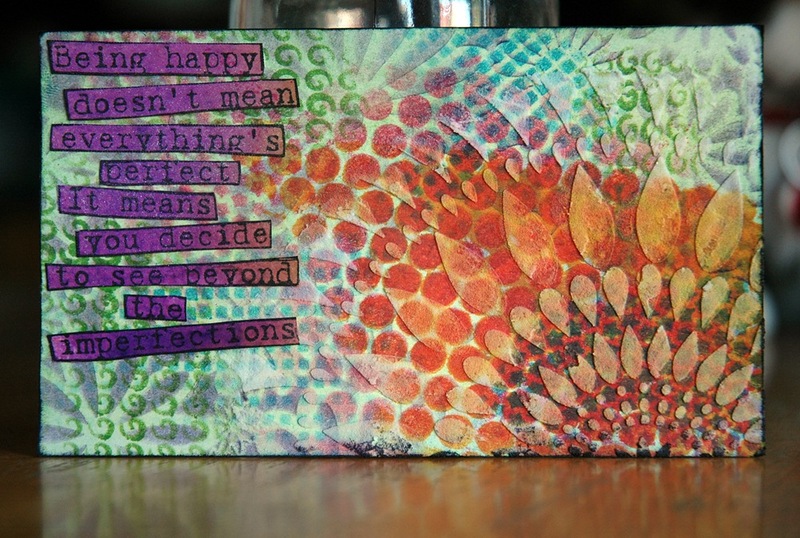 I finished by stamping the sentiment on a pre-made background of a contrasting colour, then cut it out and added it. As always, I love the shine – it makes me happy! Hoping to be back tomorrow with another couple of cards or maybe vacation photos – I haven’t forgotten about that! I’m so sorry. My mojo is still in hiding so you have to suffer through another blerg card. You can leave now and come back tomorrow, I don’t mind, really! Still here? Well, don’t say you weren’t warned…. Another premade background, this time with flexible molding paste and coarse pumice gel – the texture is amazing! 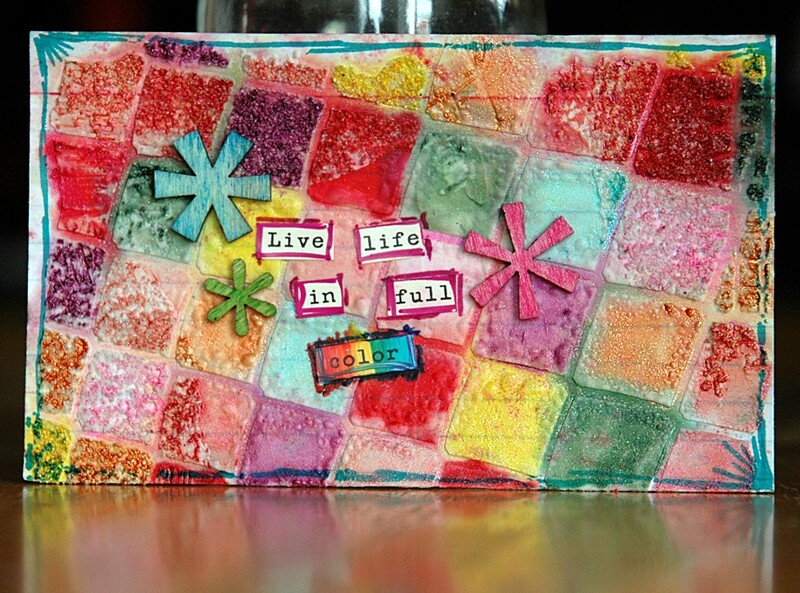 I painted each little block with different coloured Twinkling H2O’s, then misted with water to blend them all a little. 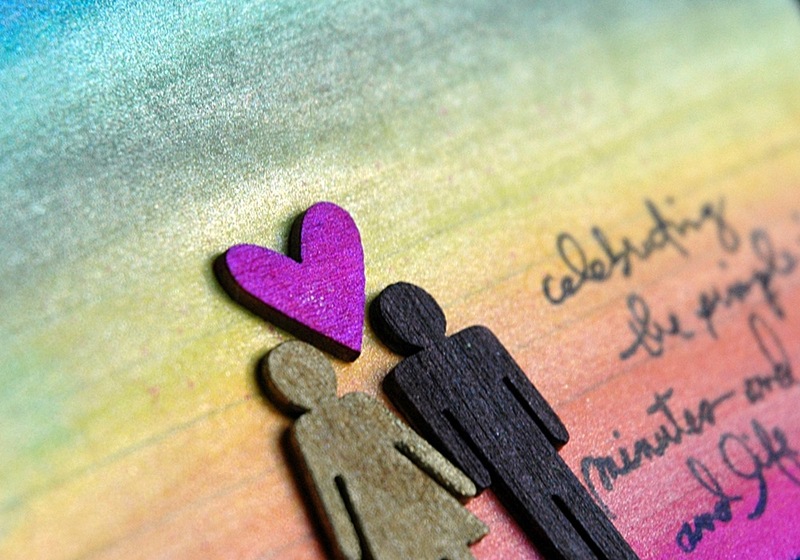 I blotted with a paper towel and thought, “Blech.” Seriously. That was the word that came to my mind. I took a Cosmo Cricket phrase sticker, cut it up, stuck it down and drew lines around the pieces. 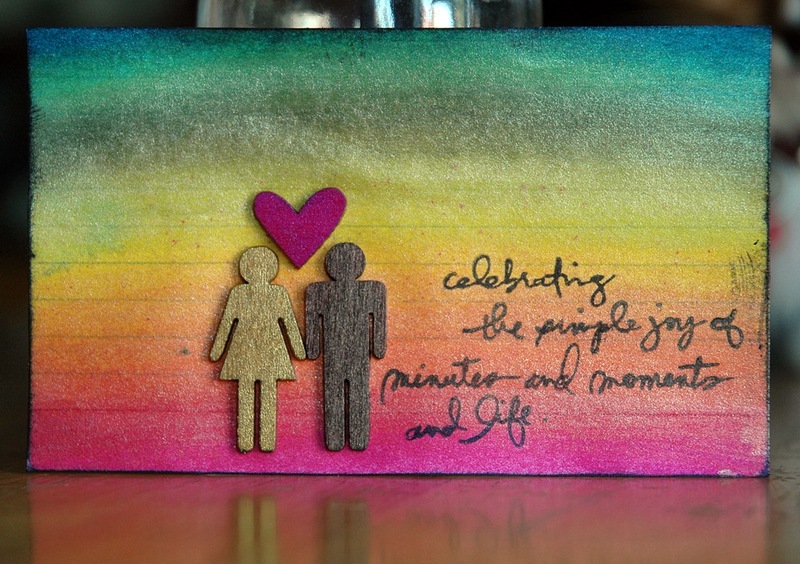 Then I coloured in the word “color.” Then I inked some wood veneer pieces and stuck them down. Then I threw my hands in the air and called it done. 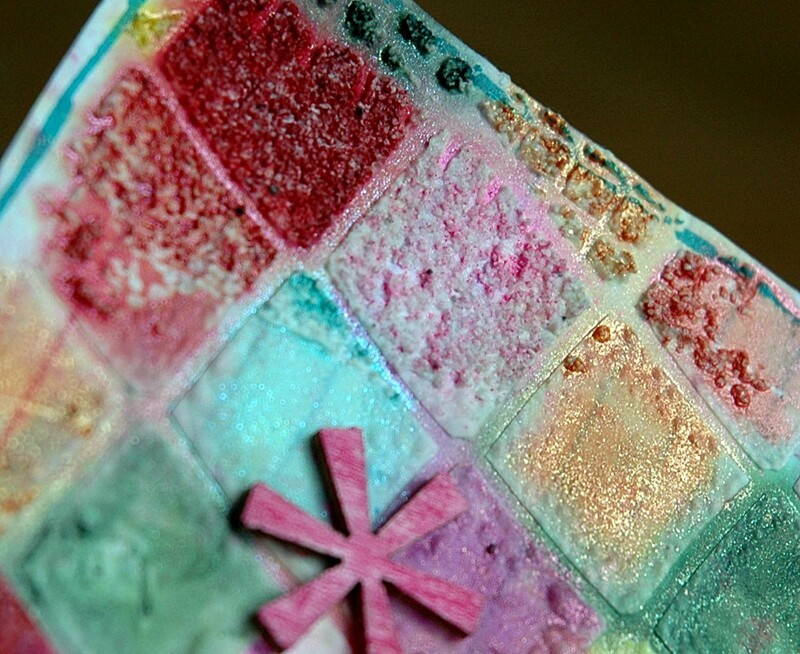 The texture and shimmer is cool I guess. I’m sulking now…. 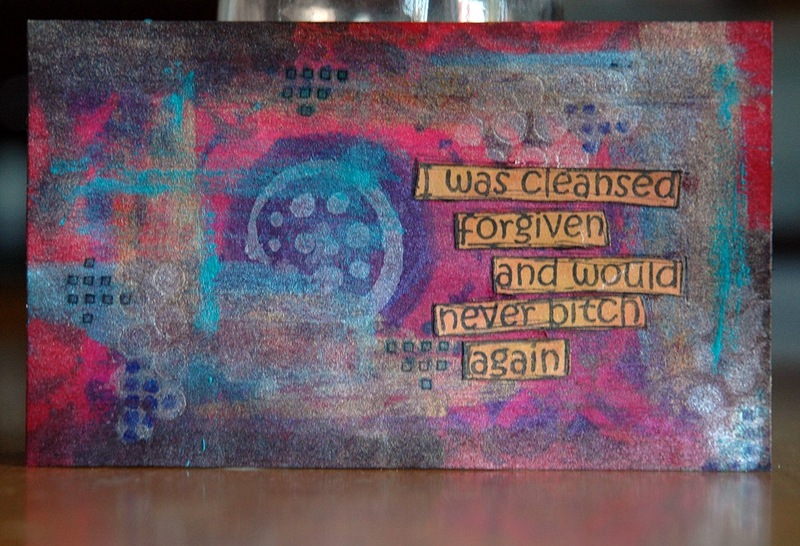 Later, I’m finding my mojo, beating it into submission, and doing a good card. Or else. Only 3 weeks left to this fun venture! Can’t believe I’m this far along already! The problem is that my mojo went on vacation – argh! 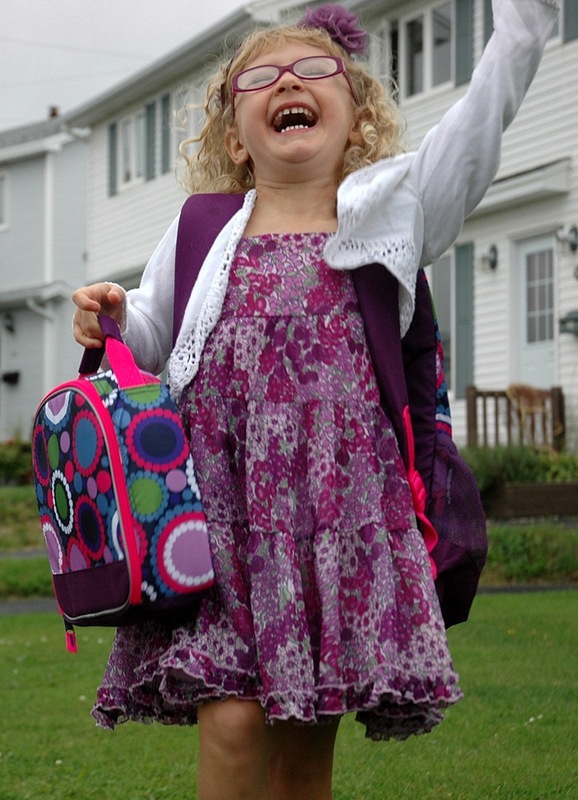 Vacation is next week, not this one! 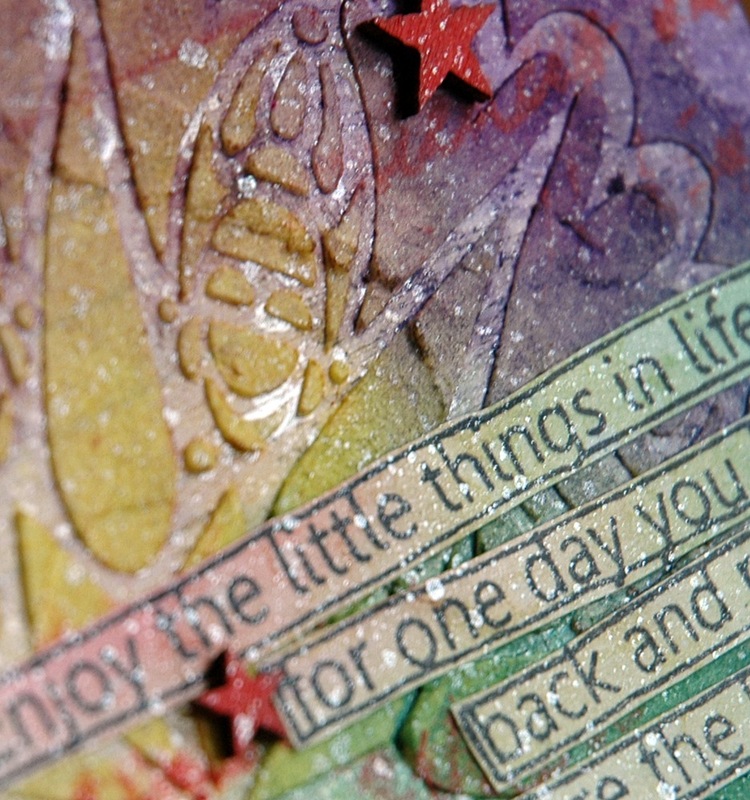 I laid a couple of stencils over the top and rubbed in Distress Ink which I highlighted with white gel pen. 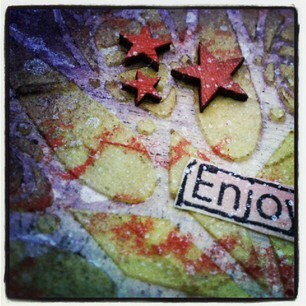 I stamped a bunch of words from a Technique Tuesday set, then used Pumice Stone Distress Ink to stamp the script background. I was so fed up with it at that point that I dated the back and said enough! Blerg. Oh well, they can’t all be masterpieces, right? 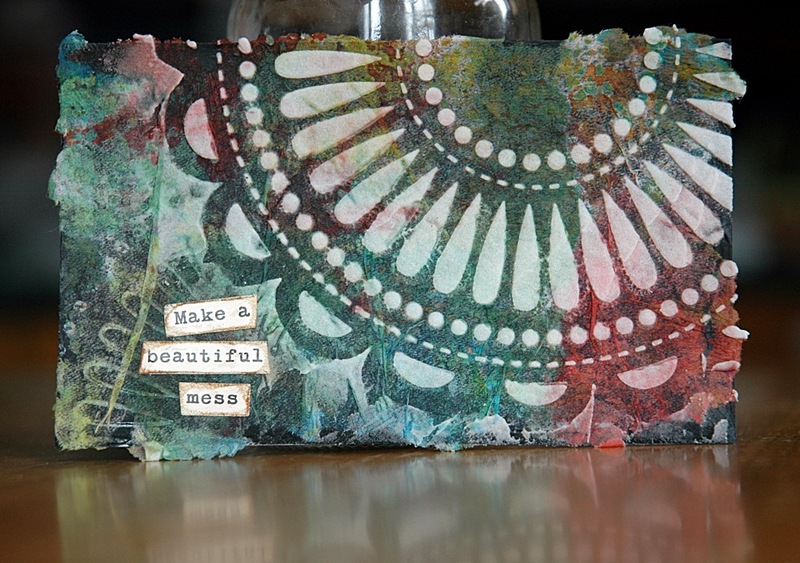 For this card I wanted to try a technique that I’ve used many times before, but it has a twist that Kristina Werner did in the newest Online Card Classes: Stretch Your Stamps Class. 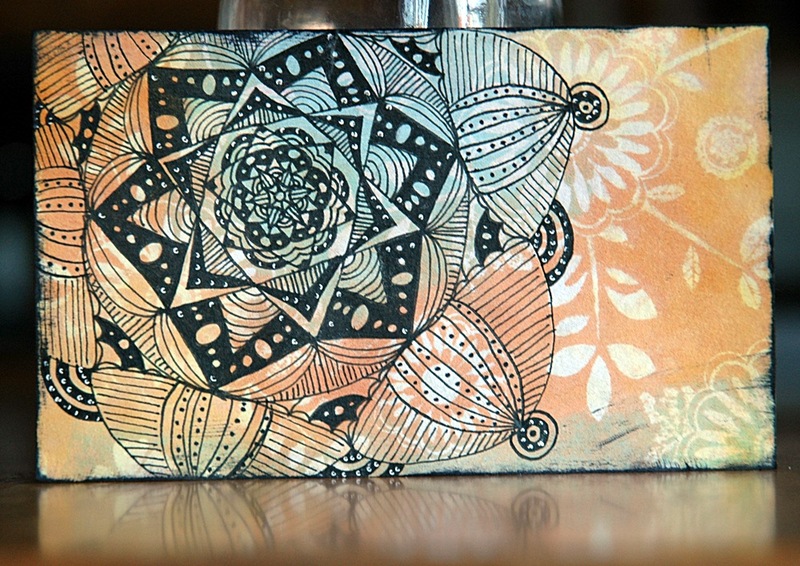 I inked the background with the new Summer Seasonal Distress Inks, dried it, and then stamped a script background with VersaMark Ink. 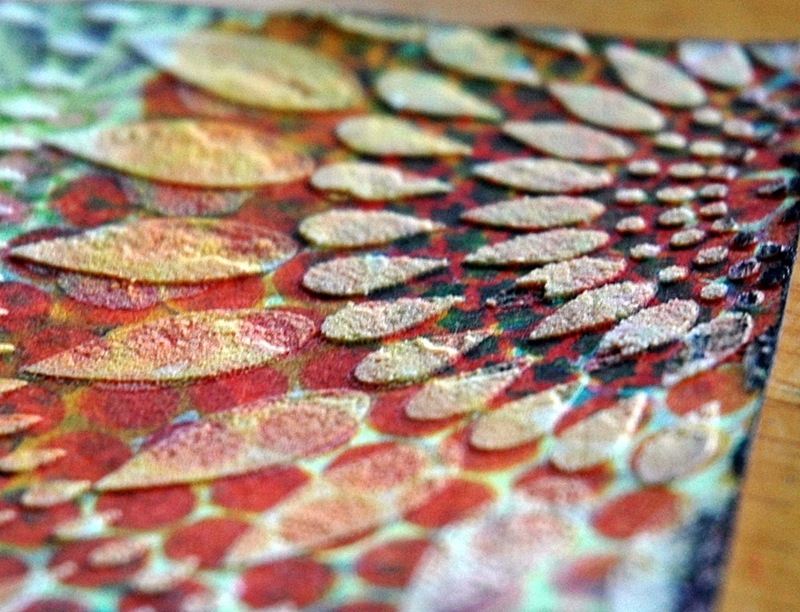 I heat embossed in clear and then rubbed black ink over the whole card. After wiping away the excess, I got this super cool look with the multicoloured text showing. 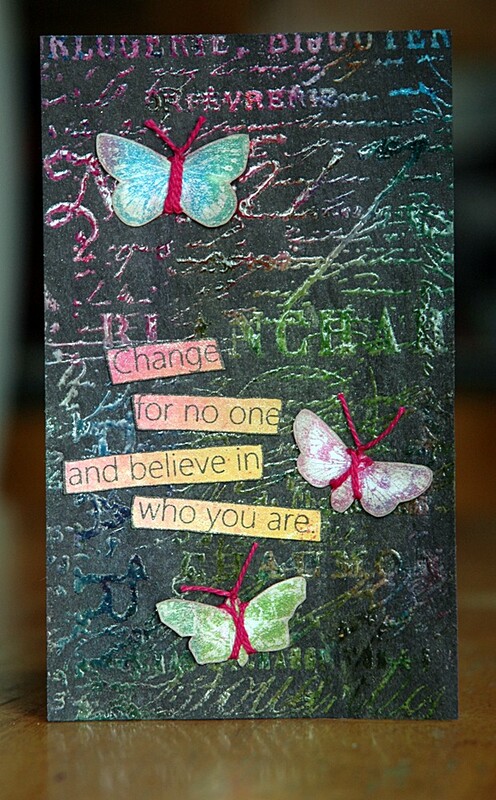 I inked a butterfly stamp with same colours and misted to blend, then stamped on a scrap card. 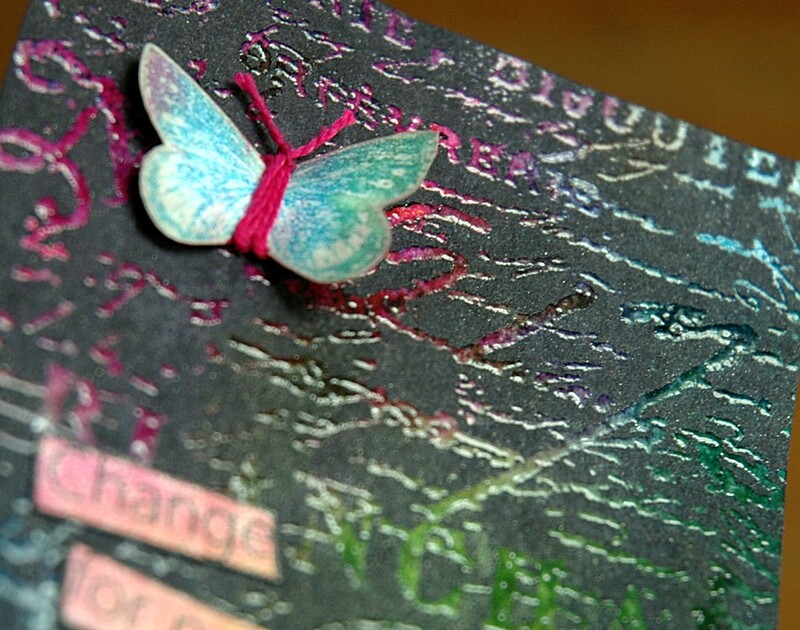 I cut out the butterflies, wrapped coloured string around for the antennae, then adhered them with rolled glue dots. 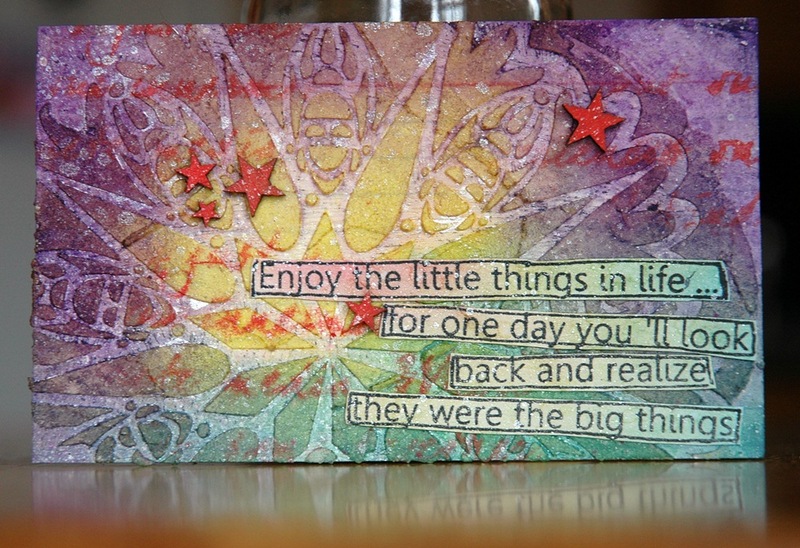 I stamped the sentiment on a previously made background card, cut it out, stuck it on and the card was done! 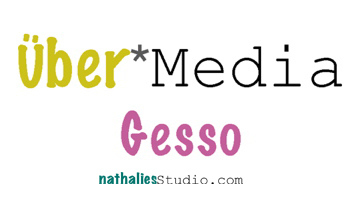 Love how the multicoloured background turned out – I’ll be using this again for sure! 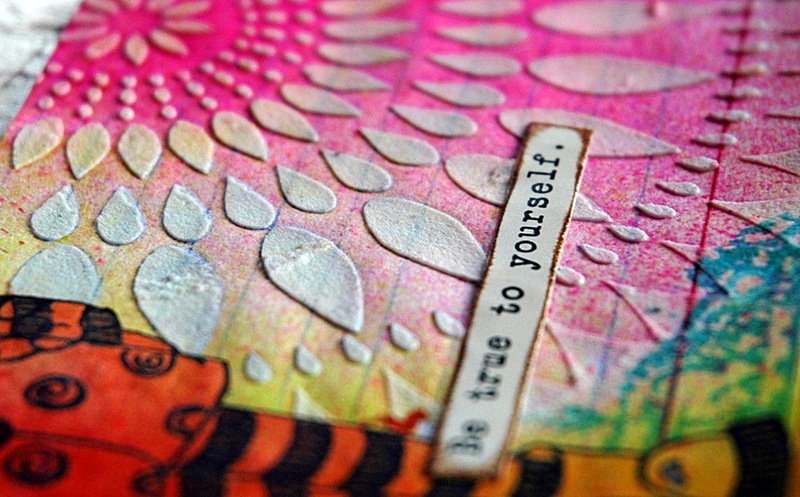 And the dimension of the butterflies with the shine of the embossing is great!